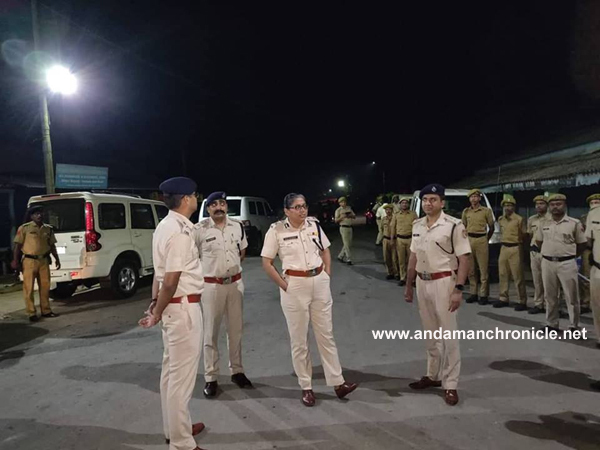 Port Blair, April 9: In view of the upcoming Lok Sabha Election 2019, the Andaman & Nicobar Police has intensified the Night Patrolling in the islands under the supervision of Inspector General of Police (Law & Order), Smti Shalini Singh, IPS. Patrolling teams will be moving around the city to check on illegal activities in order to ensure implementation of Model Code of Conduct for a free and fair election. Shri Sanjib Kumar Mandal, Adhyaksh, Zilla Parishad called on Admiral D K Joshi, PVSM, AVSM, YSM, NM, VSM (Retd. ), Hon’ble Lt Governor of A&N Islands & Vice-Chairman Islands Development Agency at Raj Niwas on 26th October 2018. On the joyous occasion of the 350th birth anniversary of Sri Guru Govind Singh ji, the 10th Sikh Guru, I extend my warm greetings to the people of Andaman and Nicobar Islands. Sri Guru Govind Singh ji, infused the spirit of both sainthood and soldier in the minds and hearts of his followers to fight oppression in order to restore justice, peace, righteousness (Dharma) and to uplift the downtrodden people in this world. His teachings are very scientific and most suitable for all times. On this auspicious festival occasion, let all the people of the Islands come together and pray to the Almighty to bless these Islands with peace, progress and prosperity. 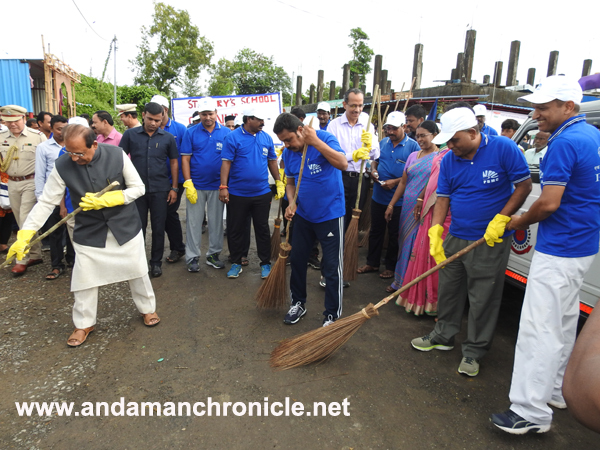 Port Blair, Sept. 17: The Hon’ble Prime Minister of India has given a clarion call for a nationwide shramdaan and cleanliness campaign to be taken up by all stakeholders from 15th September 2017 to 2nd October 2017, with the theme “Swachhata Hi Seva”, to celebrate the spirit of the mission as a ‘Janandolan’, as a run up to the third anniversary celebrations of the launch of the Swachh Bharat Mission. On the aforesaid call Port Blair city embraces “Swachhta Hi Sewa” pakhwada. The Lt. Governor, Andaman & Nicobar Islands, Prof. Jagdish Mukhi in the presence of Shri. Anindo Majumdar, Chief Secretary, Shri. B. Eswar Rao, Chairperson, PBMC, Shri. S.C.L. Das, Principal Secretary (UD), Secretary, PBMC, Senior Vice Chairperson, Junior Vice Chairperson and ward councilors launched the campaign at Bhatubasti vegetable market on 15th September 2017. In his speech the LG expressed his happiness that Port Blair Municipal Council has taken up a subject that was taken up by Hon’ble Prime Minister of India in his first speech from Red fort. 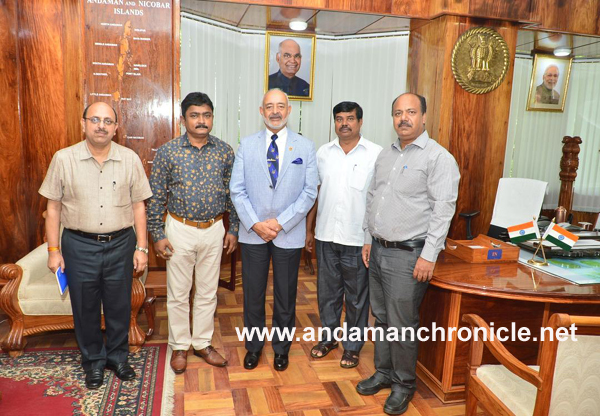 He congratulated the efforts of the citizens and Port Blair Municipal Council to keep this city clean, thereafter he stressed that the cleanliness is not only the duty of the sanitary worker but also the duty of every citizen. He explained the impact of the “Swachh Bharat Mission” on the lifestyle of the citizen of India. He appreciated the dedicated efforts of Port Blair Municipal Council to lead Port Blair city towards Open defecation free status and at the end of the pakhwada i.e on 2nd October 2017, Port Blair city will be formally declared as Open Defecation free city. He also announced that the whole of Andaman & Nicobar Islands will become Open Defecation Free by 31st March 2017. The event was followed by cleanliness drive at Bhatubasti Vegetable Market which was also actively participated by the students of St. Mary School, Bhatubasti. During the fortnight elaborate arrangements have been made for cleanliness drive. Port Blair Municipal Council is conducting ‘SWACHH WARD’ campaign under the leadership of respective ward councilors for which best ward will be awarded for cleanliness. The Port Blair Municipal Council during the period will hold a logo competition with the theme ‘Swachh Bharat Swachh Port Blair’. Cash awards will be given to best logo selected on 2nd October 2017. The programmes will conclude on the occasion of Gandhi Jayanti on 2nd October 2017 by declaring Port Blair as Open Defecation Free. Saving water is the simplest and least expensive way to protect our water resources. Water is scarce yet we take it for granted, waste it and even pay for the expensive packaged water bottles. Let us all be responsible and do our part in conserving the most precious gift of nature by adopting the following points strictly.  All citizens must get float valve fixed in their over head tanks and sump tanks to stop wastage of water.  It is seen that during the supply hours publics use pump to draw water from our feeder lines which needs to be avoided strictly so that equal distribution of water is made to all. Strict action along with disconnection of pipe line will be taken against all defaulters.  To avoid overflowing of tanks.  Not to hamper PBMC feeder lines illegally.  Avoid washing of cars directly from pipe line.  Any complaints or leakages of water identified by public may be informedon the flowing numbers. 3. Superintendent Engineer, PBMC- 9933243980. 4. Executive Engineer (Water Works)-9434282823.